This will be perfect for work or nice outings. Go ahead and orders yours today. They make great gifts too. Camel Suede watch strap is easily interchangeable, which allows a greater customization for always being versatile. A classy touch with the Camel Suede watch strap, with stylish Buckle. 100% Brand New & Excellent Flexibility & Safe & Fashion. Soft and comfortable, Buckle design, Scratch resistant. 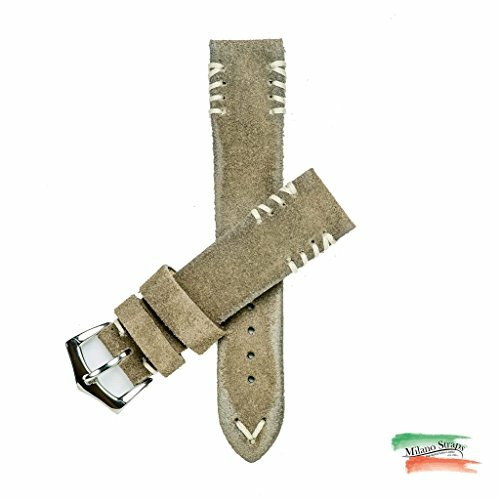 Camel Suede watch strap six red stitches is skin-friendly, soft & comfortable. Microfiber outside provide a feeling of warmth, durable & elegant also. gives your tracker a fashion look, makes it more like a watch. Indulge yourself in the ambience of art and literature by this unique watch bracelet. Convenient: The quick release design allows you to quickly and easily install. Comfort: soft, soft, soft!!! The When you first remove it from the packaging, you will find it very soft, comfortable to wear and not stiff. Please DO NOT wear this watch band for longtime underwater activities - such as shower, swimming, etc. If you have any questions about this product by Milano Straps, contact us by completing and submitting the form below. If you are looking for a specif part number, please include it with your message.